Hola amigos soy Patrick, soy un niño de 12 años y vivo en una casa rural en Extremadura. En este blog voy a intentar enseñaros todo sobre el cielo de noche. Hi friends I am Patrick, I am a 12 year old boy and I live in a guest house in Extremadura, Spain. In this blog I hope to tell you all about the sky at night. 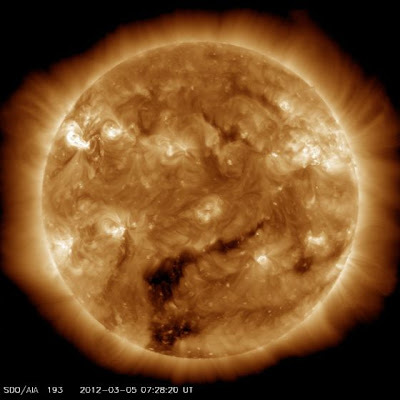 STRONG SOLAR ACTIVITY: Solar activity is now high. Big sunspot AR1429, which emerged on March 2nd, is crackling with strong flares. This morning brought the strongest so far--an X1-class eruption on March 5th at 0413 UT.